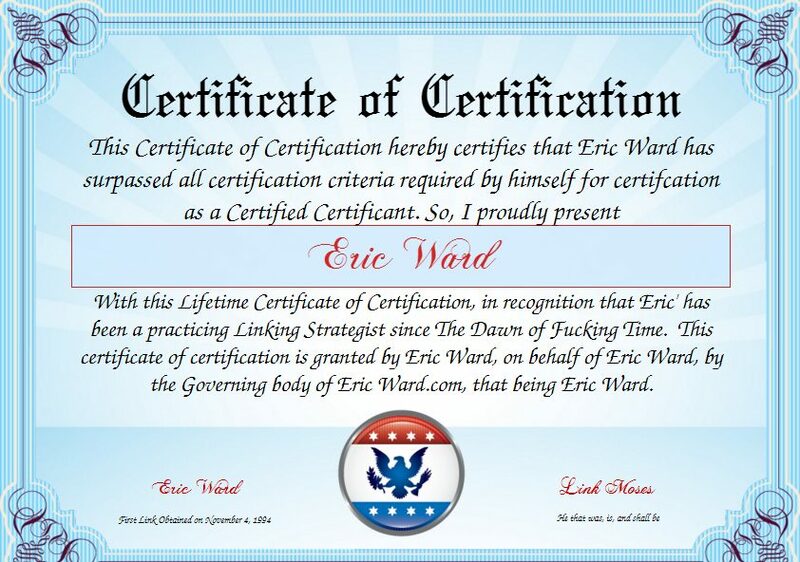 When I began in this industry in 1994 there was not a single certifying body. There was me and my 14.4 modem at my kitchen table. And that worked out just fine for my first big client, Amazon.com. Jeff Bezos hired me to help him promote the debut of some crazy online bookstore idea nearly two decades ago. And it worked out for the 1,000+ clients I’ve worked with since, and it worked for the 165 conferences I’ve spoken at, and the 22 different sites and magazines I’ve written for. And the publisher of the book I wrote with Garrett French seems to be happy as well, since our book is in its 3rd printing. Why? Because I’ve seen the work done by “certified” link builders, SEO “pros”, marketing “experts” and the majority of it is useless crap. 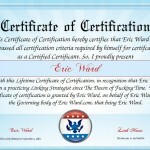 However, if it will make you happy, below is my certification. I hope this gives you the confidence you need to feel good about working with me. I know reading it makes me feel very very special.